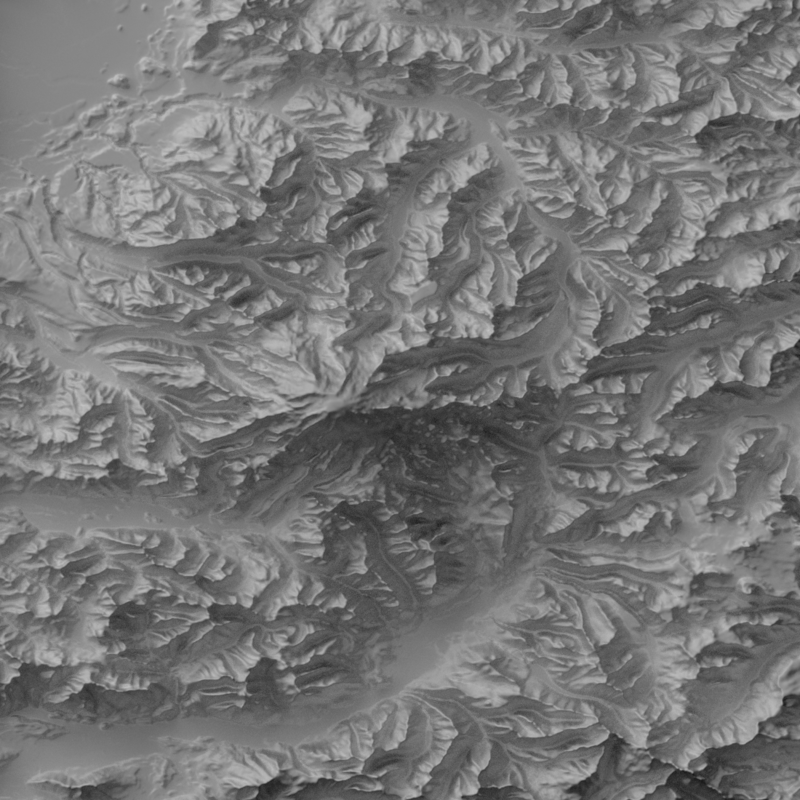 Throughout my brief cartographic career, I’ve been a fan of shaded relief, but I’ve also struggled to create one that I found satisfactory. I haven’t had the time to learn how to draw relief manually, and so I rely on the old standard digital hillshade algorithm, plus the judicious application of Photoshop (having learned from folks like Tom Patterson and Tanya Buckingham how big of a difference it can make). I’ve also posted here on some efforts to do a bit of spatial analysis to improve the end result. But, I am still often dissatisfied with the final product. Lately, though, I’ve been experimenting with something that I think could represent a substantial improvement over the standard techniques for doing a digital hillshade. I’ve been messing around with Blender, a free 3D modeling program. I got started with Blender because I wanted to do some oblique terrain maps (a la Natural Scene Designer), and because I also wanted to do some 3D printing for a project I’m working on. 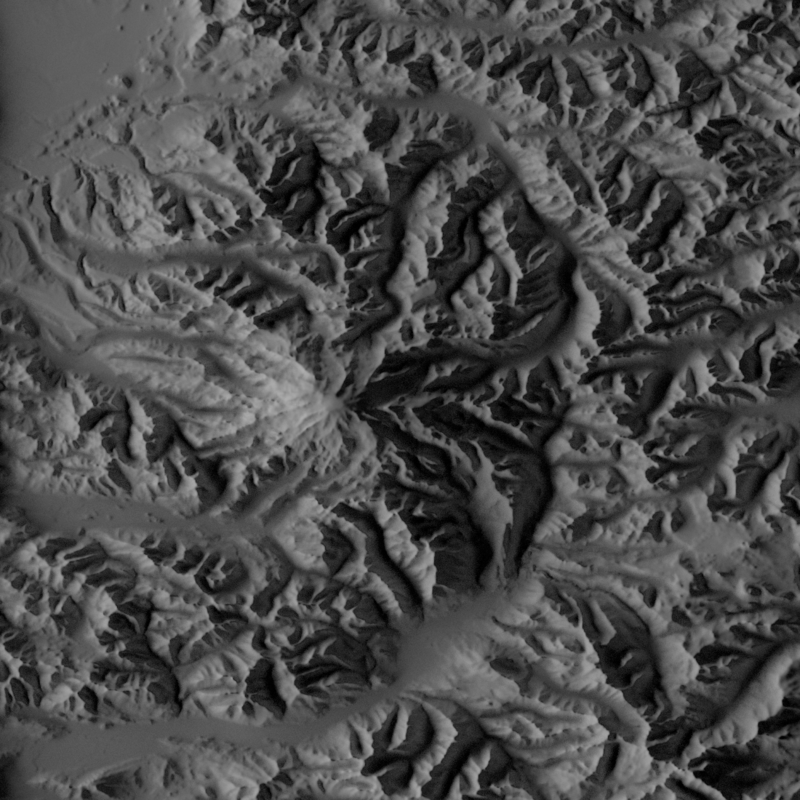 But I also realized it might be the solution for shaded relief. So, I used a DEM to create a 3D terrain mesh inside Blender, then positioned my camera directly above it, and started doing some rendering. Here’s what I’ve gotten so far. First off, here’s one that mimics what you’d get out of ArcMap or some other standard GIS algorithm. Nothing special, but it’s a good starting point for comparison. This one is much better. All I’ve done here is turn on two things: shadows and light bounces. Places facing away from the sun are now in shadow, with the shadow length depending on the height of the terrain. The light bounces allow us to still see the shadowed areas, though. 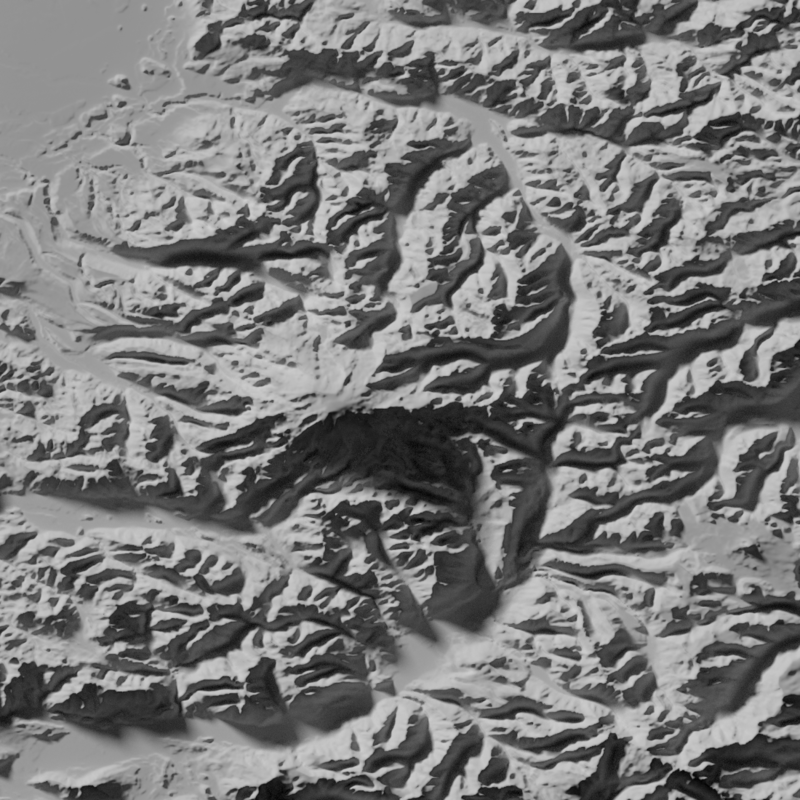 Blender figures out that the backside of the mountain, while not receiving direct sun, will still be illuminated by light striking nearby ridges and scattering around. So, it traces the path of the light rays and determines how light moves around the scene to create a much more realistic result. 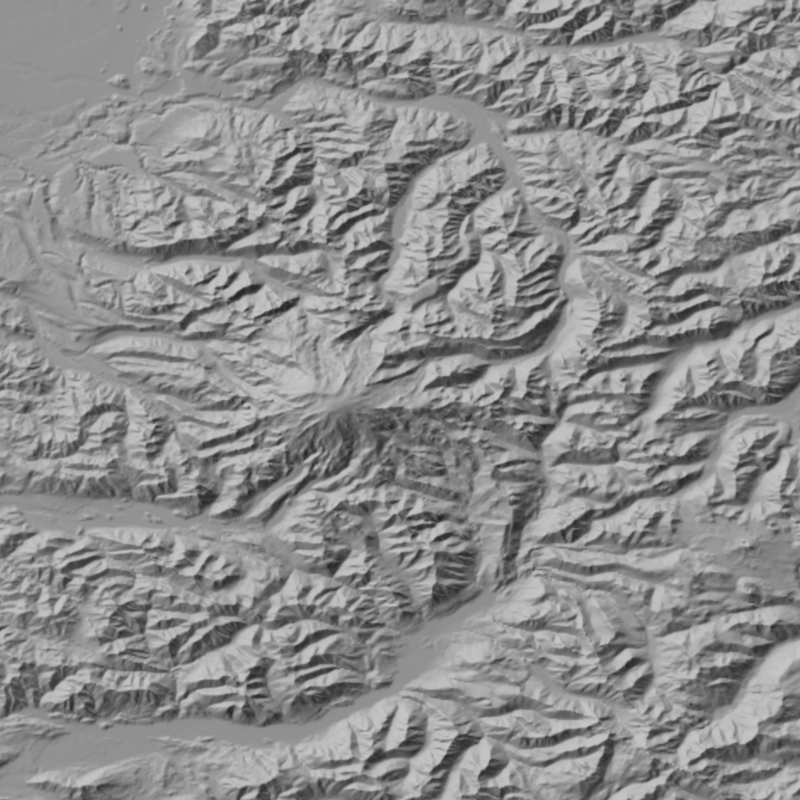 In ArcMap, you can turn on shadows in your shaded relief, but it just makes everything black if it’s caught in a shadow; it’s not equipped to re-light those shadows by looking at light scattering. We can also change our light angle, or strength, to simulate different times of day. Here’s one with a low sun angle, coming from the west. 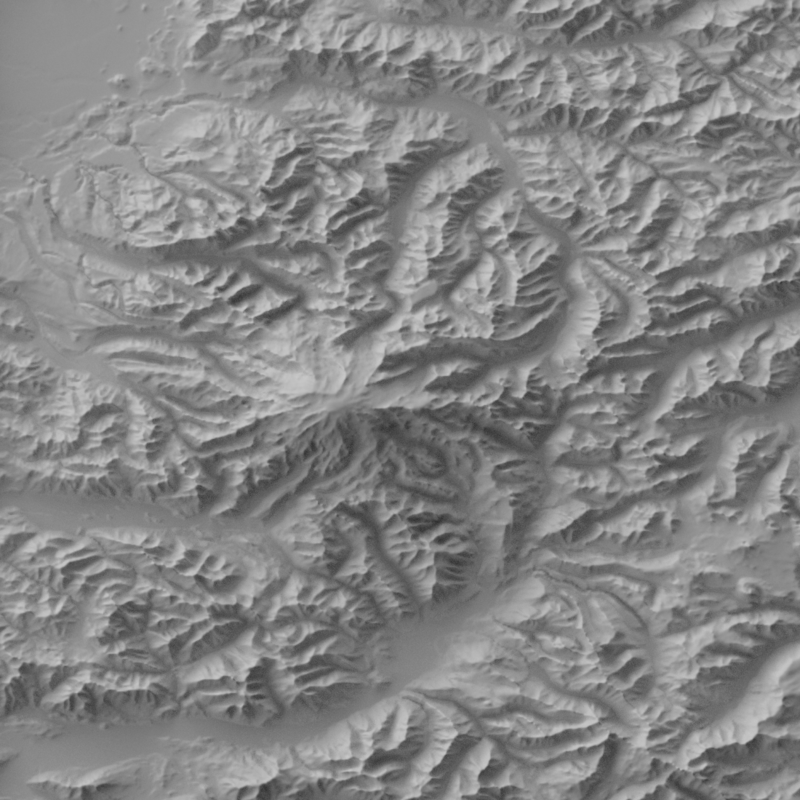 Again, you could aim for something like this in a GIS program, but it’s not likely to turn out quite so nicely, because it doesn’t have the ability to calculate the way light bounces around and dimly illuminates those east-facing slopes. They’d just be in a solid black shadow. Or, if you didn’t turn on shadows, they’d be lit as though the mountain isn’t in the way. Now it’s as though we’re on the moon, or some other harshly-lit place, with much sharper shadows. 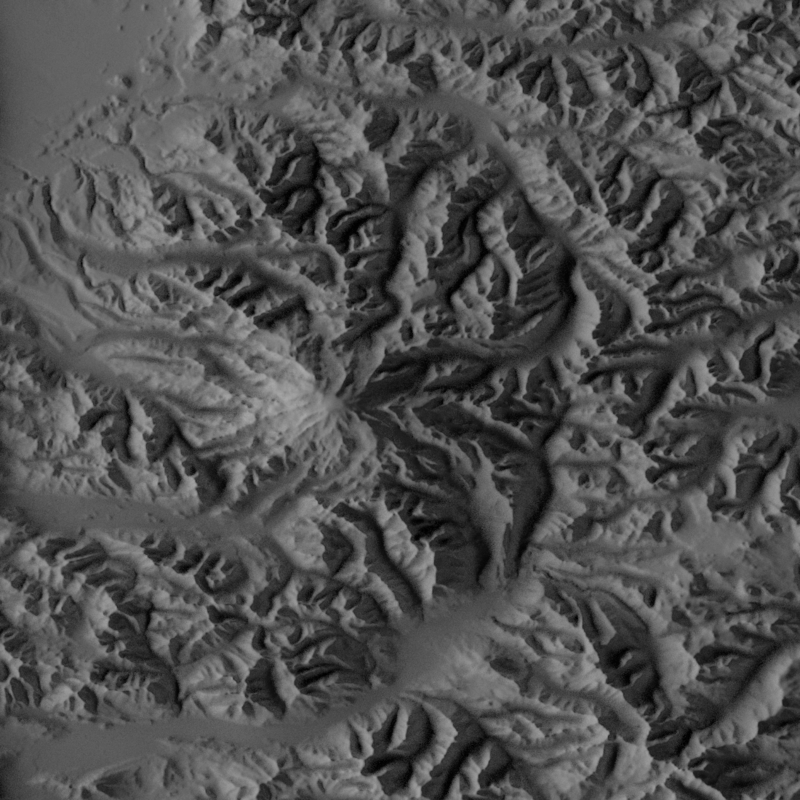 In the end, I think this could be the way to go for a lot of my future shaded relief needs. It does, admittedly, take longer to accomplish. Each test render can take several minutes. But I think the quality is a lot higher. I don’t think this is necessarily the be-all, end-all, last word in doing automated relief. 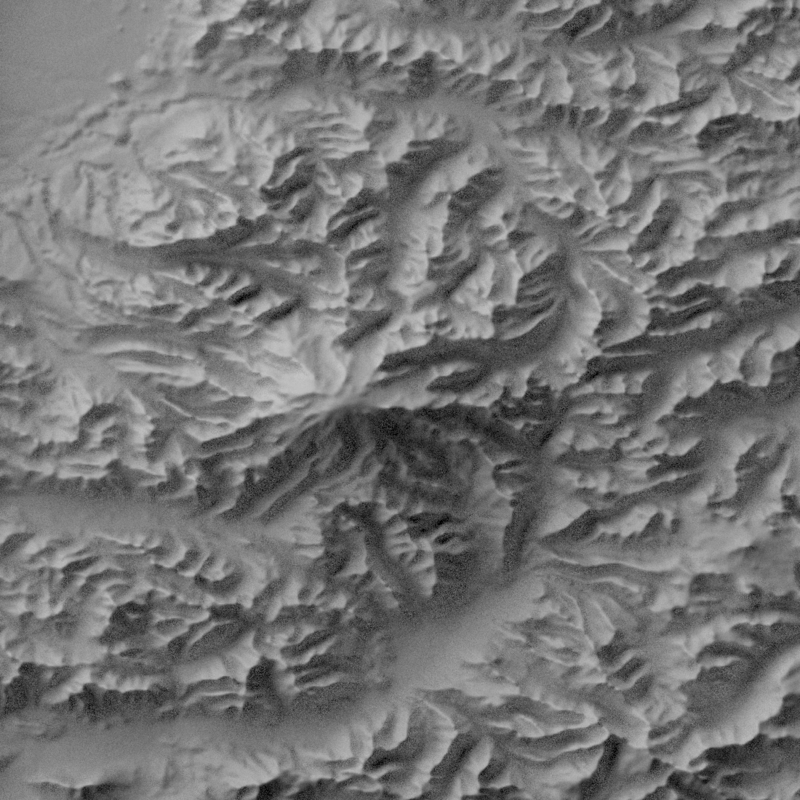 It could probably be improved further via some of the same techniques people use to improve standard GIS hillshades. But I think it’s a better foundation than the standard algorithm, and I’m looking forward to playing around with it more. At some point in the future, I’m hoping to put together instructional materials on using Blender for shaded relief. But I don’t think I’m quite ready yet. I don’t know the program well enough to be able to say that I’m doing things in the most efficient and effective manner, and I haven’t quite pieced together the best way to explain everything clearly. In the meanwhile, I encourage you all to experiment with it, and to tell me if you’ve tried anything similar in the past. I imagine I’m not the first to think of this.